Definition at line 34 of file CLayout.h. Definition at line 38 of file CLayout.cpp. Definition at line 52 of file CLayout.cpp. References CCopasiVector< T >::add(), CCopasiVector< T >::begin(), CCopasiVector< T >::end(), CLTextGlyph::getGraphicalObjectKey(), CLGraphicalObject::getKey(), CCopasiObject::getKey(), CLReactionGlyph::getListOfMetabReferenceGlyphs(), CLGeneralGlyph::getListOfReferenceGlyphs(), CLGeneralGlyph::getListOfSubglyphs(), CLMetabReferenceGlyph::getMetabGlyphKey(), CLReferenceGlyph::getTargetGlyphKey(), mvCompartments, mvGraphicalObjects, mvLabels, mvMetabs, mvReactions, CLTextGlyph::setGraphicalObjectKey(), CLMetabReferenceGlyph::setMetabGlyphKey(), CLReferenceGlyph::setTargetGlyphKey(), and CCopasiVector< T >::size(). Definition at line 216 of file CLayout.cpp. Definition at line 234 of file CLayout.cpp. add Glyph to layout. The layout takes ownership of the glyph. Definition at line 239 of file CLayout.cpp. References CCopasiVector< T >::add(), and mvCompartments. Referenced by SBMLDocumentLoader::createLayout(), CCopasiSpringLayout::createLayout(), test000097::createModel(), and CCopasiXMLParser::CompartmentGlyphElement::start(). Definition at line 263 of file CLayout.cpp. 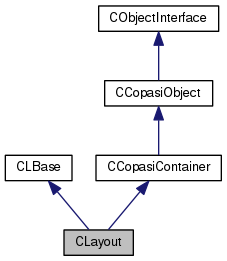 References CCopasiVector< T >::add(), and mvGraphicalObjects. Referenced by SBMLDocumentLoader::createLayout(), CCopasiSpringLayout::createLayout(), and CCopasiXMLParser::AdditionalGOElement::start(). add local render information to layout. The layout takes ownership of the object. Definition at line 646 of file CLayout.cpp. References CCopasiVector< T >::add(), and mvLocalRenderInformationObjects. Referenced by SBMLDocumentLoader::createLayout(), and CCopasiXMLParser::LocalRenderInformationElement::start(). Definition at line 245 of file CLayout.cpp. References CCopasiVector< T >::add(), and mvMetabs. Referenced by SBMLDocumentLoader::createLayout(), CCopasiSpringLayout::createLayout(), and CCopasiXMLParser::MetaboliteGlyphElement::start(). Definition at line 251 of file CLayout.cpp. References CCopasiVector< T >::add(), and mvReactions. Referenced by SBMLDocumentLoader::createLayout(), CCopasiSpringLayout::createLayout(), and CCopasiXMLParser::ReactionGlyphElement::start(). Definition at line 257 of file CLayout.cpp. References CCopasiVector< T >::add(), and mvLabels. Referenced by SBMLDocumentLoader::createLayout(), CCopasiSpringLayout::createLayout(), and CCopasiXMLParser::TextGlyphElement::start(). Calculates the Bounding Box, moves the layout to the origin and assigns it to the layout. Definition at line 955 of file CLayout.cpp. References calculateBoundingBox(), CLBoundingBox::getDimensions(), CLBoundingBox::getPosition(), CLPoint::getX(), CLPoint::getY(), CLPoint::getZ(), moveBy(), and setDimensions(). This methods calculates the bounding box of the layout. It traverses all layout objects and looks for the minimal and maximal x and y values that occur in the layout. These values are returned in the form of a bounding box where the minimal values are stored in the position and the maxima are given as the minimal values plus the corresponding dimension. Definition at line 684 of file CLayout.cpp. References CLCurve::calculateBoundingBox(), CLGraphicalObject::getBoundingBox(), CLGlyphWithCurve::getCurve(), CLBoundingBox::getDimensions(), CLDimensions::getHeight(), getListOfCompartmentGlyphs(), getListOfGeneralGlyphs(), getListOfMetaboliteGlyphs(), CLReactionGlyph::getListOfMetabReferenceGlyphs(), getListOfReactionGlyphs(), CLGeneralGlyph::getListOfReferenceGlyphs(), getListOfTextGlyphs(), CLCurve::getNumCurveSegments(), CLBoundingBox::getPosition(), CLDimensions::getWidth(), CLPoint::getX(), CLPoint::getY(), max, and CCopasiVector< T >::size(). Referenced by CQGLLayoutPainter::calculateAndAssignBounds(), calculateAndAssignBounds(), and CCopasiSpringLayout::createLayout(). Definition at line 331 of file CLayout.cpp. References getKey(), CCopasiObject::getKey(), CLMetabReferenceGlyph::getMetabGlyphKey(), CLMetabReferenceGlyph::getRole(), mvMetabs, mvReactions, CLMetabReferenceGlyph::PRODUCT, CCopasiVector< T >::size(), CLMetabReferenceGlyph::SUBSTRATE, writeDotEdge(), and writeDotNode(). Definition at line 392 of file CLayout.cpp. References SBMLDocumentLoader::convertLayoutObjectKeys(), CSBMLExporter::createUniqueId(), CLTextGlyph::exportReferenceToSBML(), CLMetabGlyph::exportToSBML(), CLCompartmentGlyph::exportToSBML(), CLTextGlyph::exportToSBML(), CLGeneralGlyph::exportToSBML(), CLReactionGlyph::exportToSBML(), getKey(), CLGraphicalObject::getKey(), CLGeneralGlyph::getListOfReferenceGlyphs(), CLDimensions::getSBMLDimensions(), mDimensions, mvCompartments, mvGraphicalObjects, mvLabels, mvLocalRenderInformationObjects, mvMetabs, mvReactions, and CCopasiVector< T >::size(). Definition at line 76 of file CLayout.h. Referenced by CQGLLayoutPainter::calculateAndAssignBounds(), CQGLNetworkPainter::createGraph(), CLLayoutRenderer::draw_layout(), CCopasiSpringLayout::randomize(), and CCopasiXML::saveLayoutList(). Definition at line 71 of file CLayout.h. Referenced by CQLayoutsWidget::createLayoutWindow(), exportToDotFile(), exportToSBML(), CCopasiXML::saveLayoutList(), CQLayoutsWidget::slotShowLayout(), and CQNewMainWindow::updateLayoutList(). Definition at line 81 of file CLayout.h. Referenced by CLayoutState::applyTo(), calculateBoundingBox(), CLayoutState::CLayoutState(), CQGLNetworkPainter::createGraph(), CQLayoutScene::fillFromLayout(), CLLayoutRenderer::getObjectsAt(), CLLayoutRenderer::getObjectsInBoundingBox(), CCopasiSpringLayout::initFromLayout(), moveBy(), CCopasiSpringLayout::randomize(), CCopasiXML::saveLayoutList(), CQNewMainWindow::slotCalculateDimensions(), CQNewMainWindow::slotRunRandomizeLayout(), CLayoutState::tagLayout(), and CLLayoutRenderer::update_associations(). Definition at line 84 of file CLayout.h. Definition at line 133 of file CLayout.h. Referenced by CLayoutState::applyTo(), calculateBoundingBox(), CLayoutState::CLayoutState(), CCopasiSpringLayout::createVariables(), CQLayoutScene::fillFromLayout(), CCopasiSpringLayout::finalizeState(), CLLayoutRenderer::getObjectsAt(), CLLayoutRenderer::getObjectsInBoundingBox(), CCopasiSpringLayout::getPotential(), moveBy(), CCopasiXML::saveLayoutList(), CLayoutState::tagLayout(), and CLLayoutRenderer::update_associations(). Definition at line 136 of file CLayout.h. Returns a const reference to the list of local render information objects. Definition at line 149 of file CLayout.h. Referenced by CLLayoutRenderer::change_style(), SBMLDocumentLoader::createLayout(), CQLayoutScene::initializeResolver(), CCopasiXML::saveLayoutList(), CQNewMainWindow::slotRenderInfoChanged(), CQLayoutView::slotRenderInformationChanged(), CCopasiXMLParser::LocalRenderInformationElement::start(), updateRenderInformationList(), and CQNewMainWindow::updateRenderInformationList(). Returns a reference to the list of local render information objects. Definition at line 155 of file CLayout.h. Definition at line 94 of file CLayout.h. Referenced by CLayoutState::applyTo(), calculateBoundingBox(), CLayoutState::CLayoutState(), CQGLNetworkPainter::createGraph(), CCopasiSpringLayout::createLayout(), CCopasiSpringLayout::createVariables(), CQLayoutScene::fillFromLayout(), getMetabGlyphForKey(), CLLayoutRenderer::getObjectsAt(), CLLayoutRenderer::getObjectsInBoundingBox(), CCopasiSpringLayout::getPotential(), CCopasiSpringLayout::initFromLayout(), moveBy(), CCopasiSpringLayout::randomize(), CCopasiXML::saveLayoutList(), CQNewMainWindow::selectMetabolite(), CQNewMainWindow::slotCalculateDimensions(), CQNewMainWindow::slotRunRandomizeLayout(), CLayoutState::tagLayout(), and CLLayoutRenderer::update_associations(). Definition at line 97 of file CLayout.h. Definition at line 107 of file CLayout.h. Referenced by CLayoutState::applyTo(), calculateBoundingBox(), CLayoutState::CLayoutState(), CQGLNetworkPainter::createGraph(), CCopasiSpringLayout::createVariables(), CQLayoutScene::fillFromLayout(), CCopasiSpringLayout::finalizeState(), CLLayoutRenderer::getObjectsAt(), CLLayoutRenderer::getObjectsInBoundingBox(), CCopasiSpringLayout::getPotential(), CCopasiSpringLayout::initFromLayout(), moveBy(), CCopasiSpringLayout::randomize(), CCopasiXML::saveLayoutList(), CQNewMainWindow::selectReaction(), CLLayoutRenderer::setDeduceSpeciesReferenceRoles(), CLayoutState::tagLayout(), and CLLayoutRenderer::update_associations(). Definition at line 110 of file CLayout.h. Definition at line 120 of file CLayout.h. Referenced by CLayoutState::applyTo(), calculateBoundingBox(), CLayoutState::CLayoutState(), CQGLNetworkPainter::createGraph(), CQLayoutScene::fillFromLayout(), CLLayoutRenderer::getObjectsAt(), CLLayoutRenderer::getObjectsInBoundingBox(), getTextForItem(), CCopasiSpringLayout::initFromLayout(), moveBy(), placeTextGlyphs(), CCopasiXML::saveLayoutList(), CLayoutState::tagLayout(), and CLLayoutRenderer::update_associations(). Definition at line 123 of file CLayout.h. Returns a const pointer to the local render information with the given index or NULL if the index is invalid. Definition at line 658 of file CLayout.cpp. References mvLocalRenderInformationObjects, and CCopasiVector< T >::size(). Referenced by CQNewMainWindow::slotRenderInfoChanged(), and CQNewMainWindow::updateRenderInformationList(). Returns a pointer to the local render information with the given index or NULL if the index is invalid. Definition at line 669 of file CLayout.cpp. Definition at line 909 of file CLayout.cpp. References getListOfCompartmentGlyphs(), getListOfGeneralGlyphs(), getListOfMetaboliteGlyphs(), getListOfReactionGlyphs(), getListOfTextGlyphs(), CLPoint::isEmpty(), CLGraphicalObject::moveBy(), and CCopasiVector< T >::size(). Referenced by CQGLLayoutPainter::calculateAndAssignBounds(), and calculateAndAssignBounds(). Definition at line 328 of file CLayout.cpp. Definition at line 190 of file CLayout.h. Definition at line 77 of file CLayout.h. Referenced by calculateAndAssignBounds(), CCopasiSpringLayout::createLayout(), test000097::createModel(), and CCopasiXMLParser::LayoutElement::start(). Definition at line 380 of file CLayout.cpp. Definition at line 368 of file CLayout.cpp. Definition at line 269 of file CLayout.cpp. Definition at line 40 of file CLayout.h. Referenced by exportToSBML(), getDimensions(), operator<<(), scale(), and setDimensions(). Definition at line 38 of file CLayout.h. Referenced by CLayout(), getKey(), and ~CLayout(). Definition at line 42 of file CLayout.h. Referenced by addCompartmentGlyph(), CLayout(), exportToSBML(), getListOfCompartmentGlyphs(), and operator<<(). Definition at line 46 of file CLayout.h. Referenced by addGeneralGlyph(), CLayout(), exportToSBML(), getListOfGeneralGlyphs(), and operator<<(). Definition at line 45 of file CLayout.h. Referenced by addTextGlyph(), CLayout(), exportToSBML(), getListOfTextGlyphs(), and operator<<(). Definition at line 47 of file CLayout.h. Referenced by addLocalRenderInformation(), exportToSBML(), getListOfLocalRenderInformationObjects(), and getRenderInformation(). Definition at line 43 of file CLayout.h. Referenced by addMetaboliteGlyph(), CLayout(), exportToDotFile(), exportToSBML(), getListOfMetaboliteGlyphs(), and operator<<(). Definition at line 44 of file CLayout.h. Referenced by addReactionGlyph(), CLayout(), exportToDotFile(), exportToSBML(), getListOfReactionGlyphs(), and operator<<().